A reminder that the next regularly scheduled WRMRC operating session will be held on Saturday 09 March 2019, from 12:00 to 6:00PM. If you are interested in attending the operating session as a guest, please contact us via our Facebook page so we know how many people to expect. For a full list of club events in 2019, please see our calendar page. Happy New Year from all of us at the WRMRC. A reminder that the next regularly scheduled WRMRC operating session will be held on Saturday 12 January 2019, from 12:00 to 6:00PM. 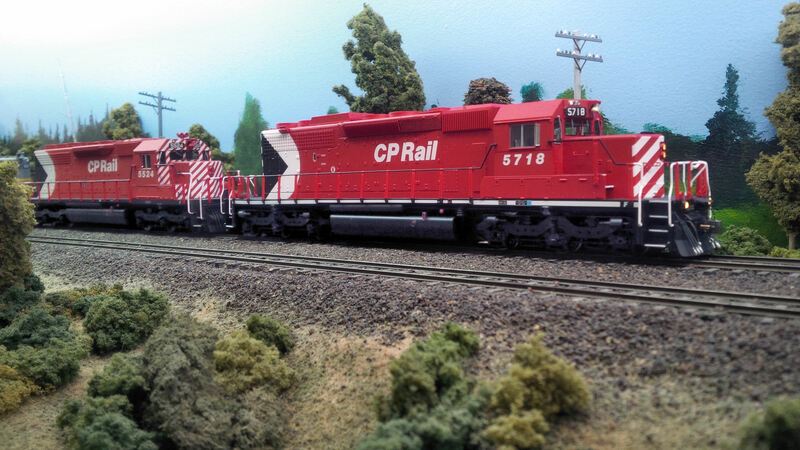 Extra 8798 West rolls through Sudbury Yard on the WRMRC’s CP Sudbury Division layout. A reminder that the next regularly scheduled WRMRC operating session will be held on Saturday 10 Nov 2018, from 12:00 to 6:00PM. For a full list of upcoming club events, see the calendar page. An edited selection of video from this past weekend’s September operating session has been posted to our Youtube channel. This past Saturday, the WRMRC marked an annual tradition that dates back to times before the formal creation of the club. Our infamous ‘Junk Night’ operating session. Engineer R.Bosma carefully backs a cut of Toronto-bound cars into the interchange track at Romford ON. 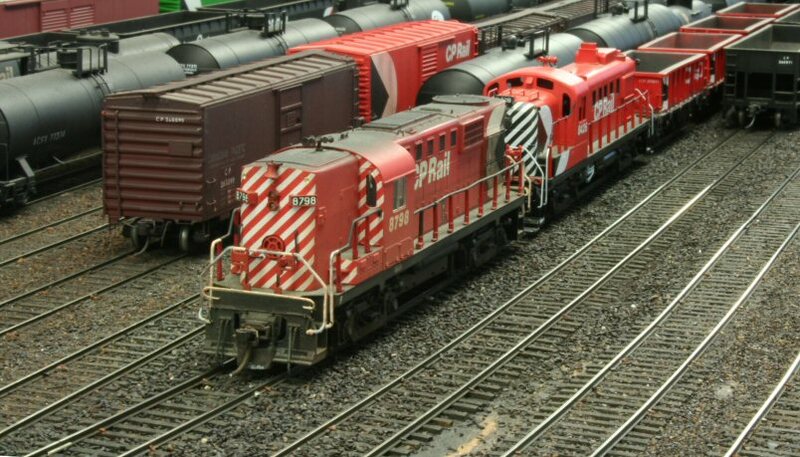 Locos for this Junk Night edition of the North Bay Turn are a CN GMD-1 / SD40-2W motive power duo. 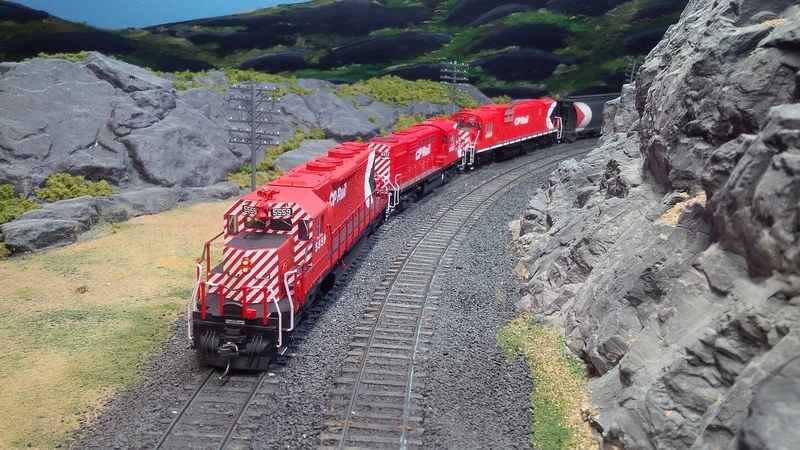 It is much better described as a non ’70s CP session, where our usual Sudbury Division trains are powered by whatever locomotives our members wish to showcase. Railway, era, prototype or totally fictional; for one day none of that matters. Many have asked us how we came up with the name. After all, none of the motive power is ‘junk.’ All are high-quality models. Well, there is a bit of history to it. 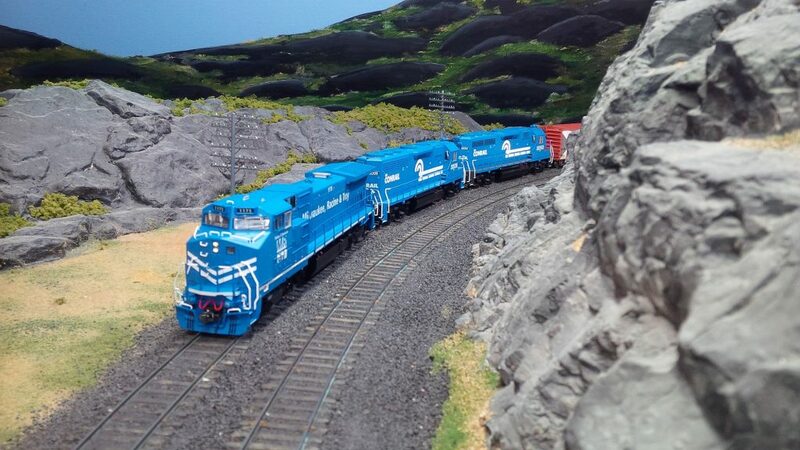 A fictional MR&T widecab GE Dash-8 leads two Conrail GP40s on a Junk Night edition of CP train 921 near Sprecher ON. 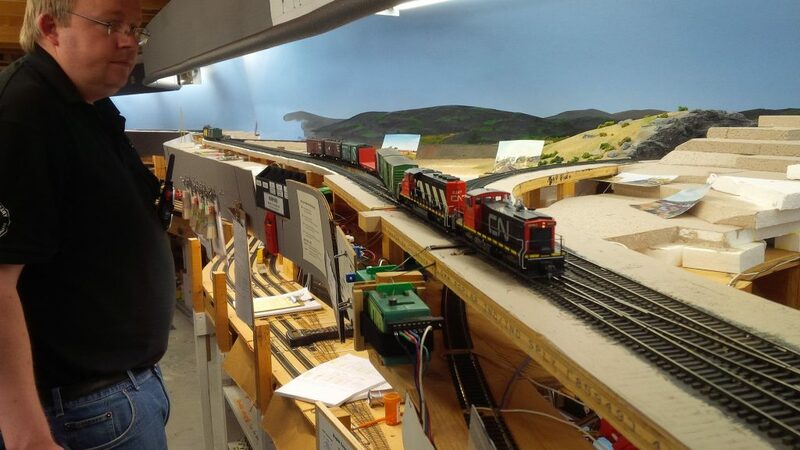 Like many model train clubs, the WRMRC was born from a private home layout. That owner (and founding president) had a large pike depicting the CP MacTier Subdivision, forged from his memories of cottage country in the 1960s. As the MacTier Sub motive power fleet was being improved, earlier locomotives purchased to get the layout up-and-running had been retired. These were mostly old ’70s-era models, mainly Athearn ‘blue box’ and Atlas ‘yellow box’ locos painted for various US railroads. So in the middle of a regular CP MacTier Sub operating session, he once quipped that we should hold a session where we break out all this “old junk power.” And from that our junk night sessions were born. 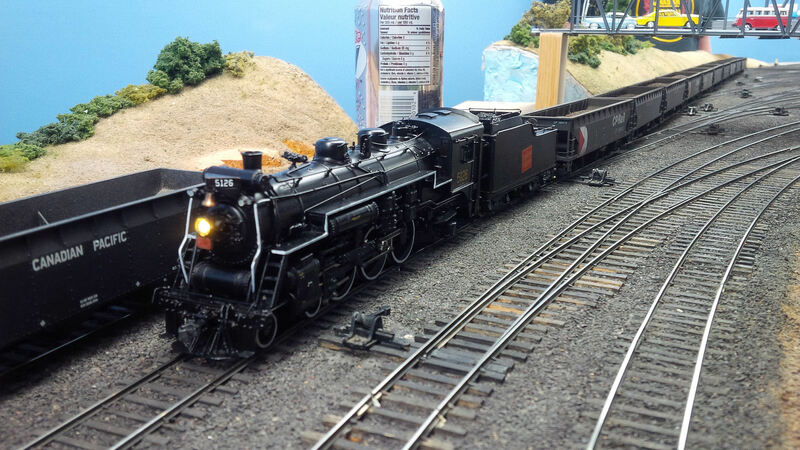 WRMRC member S. Lyons brought out his lovingly rebuilt brass model of CN J-4-e #5126 (4-6-2 MLW-built ‘Pacific’) to fill the duties of the Sudbury east yard switcher. Models like this are what cause some to question our ‘Junk Night’ moniker. Now you know the full story. It should also be noted these sessions had been held on Saturday evenings in the past. This explains the ‘night’ part in Junk Night, as we’ve switched to afternoon-held operating sessions for a number of years now. Finally, the traditional day for Junk Night was always the operating session that fell closest to April Fools Day. With the WRMRC eliminating April sessions in recent years, this now applies to our May operating date. No, this train did not take a wrong turn at St Thomas. 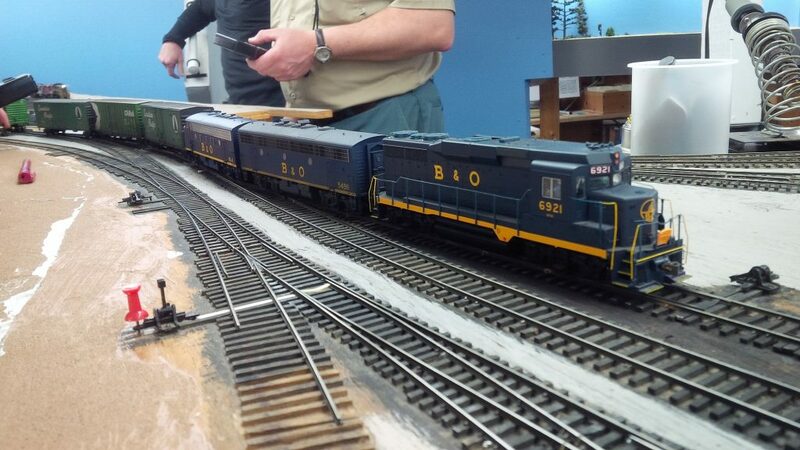 Baltimore & Ohio power finds its way to Sudbury on this Junk Night operating session.